The earliest concert I remember is an Ella Jenkins performance when I was in pre-school. The first album I bought was The Jackson 5 Greatest Hits, and I bought it with my allowance at the local five-and-dime store. With my parents at the local coffee house venue, I got to see John Prine, John Hartford, Corky Siegal, and Steve Goodman. My first theater concert (with 22 hippie friends piled into a van) was The Grateful Dead at the old Uptown Theater in Chicago. Then I discovered punk rock. How did you first get involved with FMC? 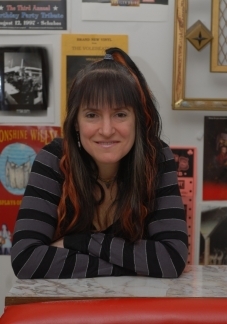 I learned about FMC from Jenny Toomey, whom I believe I met through Jon Langford and Sally Timms. What do you think are the biggest issues affecting musicans today? The two biggest issues negatively affecting musicians today are illegal downloads and lack of affordable health care. I blame the major labels for fighting new technology and their customers so long that a generation became used to getting music for free. Educating fans as to the detrimental effect that illegal downloading has on the very artists they want to support is an uphill battle, but one we must fight, if anyone is to make a living off music. On the health care front, I am hopeful that by 2014 the Affordable Care Act (if it isn’t reversed by those with more money and power than compassion and sense!) will provide reasonable options for artists to get affordable health insurance and decent care. What would you tell friends who haven’t yet donated to FMC’s Summer of Love campaign? Donating to FMC will improve the lives of the musicians you love. What’s your favorite summer album? My first favorite summer album, when I was in eighth grade, was the Beach Boys’ Endless Summer. This summer, when JC Brooks & The Uptown Sound played at Lollapalooza in the 95 degree heat, their album Want More, became my current fave. In the summer I enjoy listening to Lydia Loveless, Scott Biram, Waco Brothers and most of the other artists I work with, but they’re best after dark.